It’s all over now, folks. Fossil fuels are losing out to renewables! Renewables are taking the lead! Fossil fuels are on their way out! Headlines like these run rampant every day, with people claiming that we’ll be fossil-fuel free within the decade. They’re a little ahead of themselves, there. Granted, after the landmark agreement in Paris, where 197 countries from around the world signed on to cut greenhouse gas emissions and invest more into renewables, the dominance of fossil fuel power really did come into question. Today, I’d like to take a look at the strides our alternative energy sources have made, and where that leaves our favorite fossil fuels. Let’s make this distinction first and foremost: oil is not what we’re talking about here. The vast majority of the world’s oil is used in the form of gasoline for transportation, be it in cars, planes, or rocket fuel. Now, this is definitely energy, but it’s not a form of energy that can be compared in any meaningful way to the rest of our most widely used energy sources. After all, when was the last time you saw a coal-powered car? And for that matter, even though it’s almost a given that Elon Musk is working on it, we’re not driving around on solar power yet either. Likewise, we don’t bring barrels of crude oil home to help cook our food or charge our phones. Oil lives in a world of its own, in a way, though it does produce the most energy of any and all energy sources on Earth. 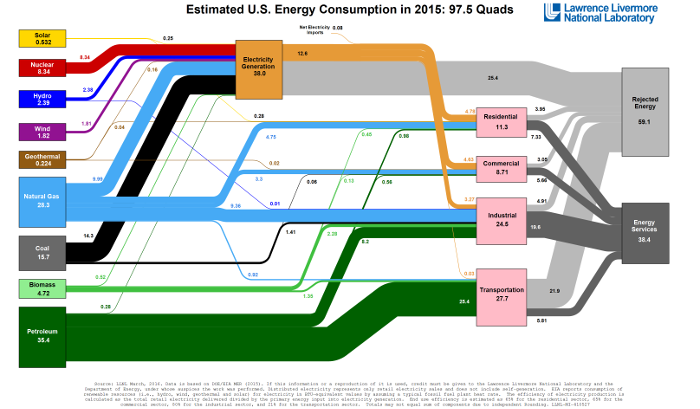 As you can see, only a negligible part of oil’s energy production went to electricity, which is what we’re focused on today. So let’s take a look at the energy sources that keep our devices running, and our lives on track. Anyone with an eye on the energy markets knows that coal is going out of style, and fast. What the chart above doesn’t show you is that in 2016, natural gas actually surpassed coal as top energy producer in the latter half of the year. The Paris Agreement wasn’t even the true beginning of the end for coal. Its dominance over the global energy mix has been waning for years, marked by coal company shut-downs and renewable energy growth. Despite the appearance of rivalry, this last hydrocarbon is actually paving the way for alternative energy solutions. You see, as the world shifts away from fossil fuel use, there will have to be something to cover the energy demand left behind. And right now, solar and wind just aren’t up to the task. It’s a matter of efficiency. The best solar panels we have can only run at about 30% efficiency, and our best wind turbines only reach just over 45%. So in the mean time, natural gas, the cleanest hydrocarbon we have, will have to do. Its emissions are only a fraction of that from coal, yet its energy production efficiency is higher! As you read this, solar and wind capacity is growing at a clip all over the world. In the U.S. alone. The country’s renewable capacity has more than tripled from 2008 levels as of 2016, and the solar market alone grew 95% for the year according to the Solar Energy Industries Association. You can see just before the official numbers cut off that natural gas took over for coal. And even if coal bounces back as the EIA expects, it won’t be for long. Meanwhile, renewables are set to surpass coal production before 2030! You’ll note that this situation was built on the basis that we’d still have the Clean Power Plan in place. Under the Trump administration, this seems about as likely as coal making a sudden come-back. Fortunately for investors in the energy space, it doesn’t matter. The U.S. clean energy industry was on the move before the CPP was announced, and it’s still going strong even now that it’s been essentially shut down. Wind and solar are, of course, the favorites. But alternatives such as hydropower, thermal energy, and even biofuel are being improved and spread as you read this. One company illustrates this trend better than almost any other: DONG Energy (NASDAQ: DENERG). The company's full name tells the story of its origins: Dansk Olie og Naturgas (Danish Oil and Natural Gas). The company was founded in 1972 as a wholy hydrocarbon producer operating in the Norwegian and Danish sections of the UK's North Sea. In 2000, DONG expanded its horizons by entering into electricity production. As we've already noted, this is entirely separate from its original operations, as oil is rarely an electricity source. Its first moves into the electricity business were through long-term investments in electricity companies. DONG's first foray into electricity production came in 2005 when it acquired Elsam and Energi E2, as well as utility companies NESA, Københavns Energi, and Frederiksberg Forsyning. These were all merged into a single company which became DONG Energy. The past decade has seen DONG Energy's view of the industry turned completely on its head. Now, rather than an oil and gas company with energy production operations, DONG wants to be an energy production company with no attachments to hydrocarbons whatsoever. The company announced that it would be divesting all of its North Sea oil and gas assets; it's not the first company to do so, either. It's currently developing what will be the world's largest offshore wind farm off the coast of Yorkshire, England. While natural gas will no doubt be the transition fuel between fossils and renewables, DONG is ready to skip ahead to all clean energy. The Hornsea project, as the wind farm is called, will utilize as many as 300 wind turbines to produce up to 1.8 gigawatts of wind energy. DONG does not build the wind turbines themselves; rather, it supplies the array cables that connect the turbines to each other and transport the electricty back to onshore energy providers. This is perhaps one of the most important roles a company can play, as the affordability of offshore wind depends heavily on getting the energy back to land for distribution. DONG Energy has not only decided to divest its oil and gas assets, but has promised to be running entirely coal-free by 2023. There's no better example of the transition from hydrocarbons to alternative energies than a company that's giving up the fossils and going all in on wind! 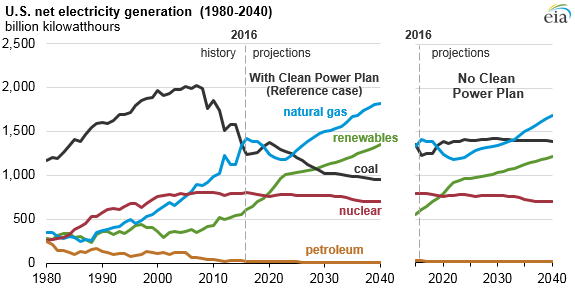 Declining coal use, after a short-lived rally under President Trump. Growing solar and wind capacity, plus shrinking prices for both the equipment and the energy they produce. These will be paired with utility-scale batteries to cover times of excess demand. And until our panels and turbines can cover all energy demand all the time, more natural gas plants will be installed to pick up the slack. Natural gas will be the last hydrocarbon standing as we make our way out of the smog and into a renewable future.